GERMANY: Offshore wind has helped German utility E.on's sales increase, but earnings fell in the company's first half report. E.on's renewables unit pre-tax earnings fell 17% year-on-year from €870 million to €720 million. The firm said the reduction was as a result of higher-than-usual 2014 figures following the sale of some assets, as part of its build and sell strategy. Sales of renewable electricity in the first six months of 2015 increased 7% to €1.2 billion compared with the same period last year. The company said this was helped by the addition of offshore projects. 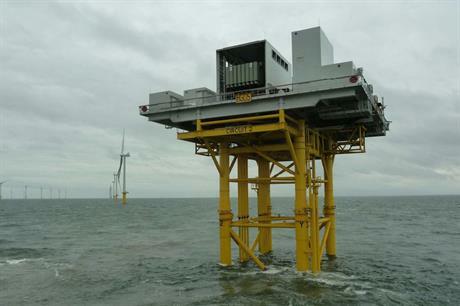 E.on completed its 219MW Humber Gateway offshore project in the UK North Sea earlier this month, and the 288MW Amrumbank West project is set to be completed this year. First power from the German North Sea project was delivered in April. According to E.on's first half report, investment in its renewables so far in 2015 was €492 million — 17% higher year on year, with a majority in offshore wind. The firm also gave an update on its decision to split the renewable, distribution networks and customer solutions units from its conventional energy business. E.on announced the split in December 2014, adding the new business would be operational by 2016. In its half year financial results released today, E.on said the new conventional power company will be called "Uniper" and should be operationally independent from 1 January 2016. E.on also said it intends to float Uniper on the stock exchange. The firm said its main businesses will have their headquarters in Essen, while Uniper, which will also operate in energy trading and exploration and production, will have its headquarters in Dusseldorf, both in North Rhine-Westphalia. Question of the Week: Should utilities operate conventional and alternative power businesses together?